The #1 Audi Sport Team WRT R8 LMS will start this year’s Total 24 Hours of Spa from the head of the field after a pair of blistering laps from Dries Vanthoor the SuperPole session. The Liqui-Moly Bathurst 12 Hour champion team and driver – and current Intercontinental GT Challenge leaders – stormed to the top spot, with the only lap under 2m19 and a full six-tenths quicker than their nearest rivals. The first entrants for the 2019 Bathurst 12 Hour, R-Motorsport, impressed when a brilliant Maxime Martin lap saw their Aston Martin Vantage GT3 secure second spot. “This wasn’t an easy one. When I got in the car, I decided to give everything that I possibly could,” Vanthoor said. The fastest 20 cars from yesterday evening’s qualifying progressed to the deciding shootout ahead of the race’s 70th edition, with each crew nominating one driver to contest two flying laps of the Spa-Francorchamps circuit. In the event only 19 cars were able to contest the session after a heavy accident in warm-up sidelined the #88 AKKA ASP Team Mercedes-AMG GT3. Raffaele Marciello was at the wheel at the time and had also been scheduled to contest SuperPole, but the French squad will now focus on repairing the damage in time for the start of the 24 Hours. Though his crew had taken fourth position on average times during Thursday’s qualifying, Vanthoor had in fact set the fastest individual lap and was therefore considered to be among the leading contenders to secure top spot in SuperPole. In the event, he made it look easy. The youngster was the 16th driver to emerge on to the track and set the fastest time of the session on his first flying lap, then went even quicker on his second run to score a truly dominant pole position. For his efforts, the Belgian ace was rewarded with a special commemorative tyre by Pirelli to mark the 70th edition of the Total 24 Hours of Spa. Vanthoor’s supremacy was confirmed by his best lap time, a 2m18.578s, which made him the only man to get below the 2m19s barrier and put 0.605s between the WRT pilot and his nearest rival. Nevertheless, Martin’s effort ensured that two Belgian drivers finished on top of the order at the country’s most famous circuit, while also setting the #62 crew up perfectly for the 24 Hours. “Firstly, I would like to congratulate Dries and Nico for their performances today,” Martin said. Swiss racer Nico Muller was third in his #2 Audi Sport Team WRT machine, lapping just under two tenths shy of the Aston Martin. Behind him Davide Rigon put the #72 SMP Racing Ferrari 488 GT3 in fourth spot, ensuring an excellent result for the Italian marque’s lone Pro class representative. Kelvin van der Linde was an impressive fifth in his Motoplast by Land-Motorsport Audi R8 LMS, ahead of another strong performer, Come Ledogar, who led much of the session in his Garage 59 McLaren 650 S GT3. Yesterday’s qualifying pacesetter, the #34 Walkenhorst Motorsport BMW M6 GT3, will start from eighth spot. Of the 10 brands represented in the SuperPole, seven were among the top-10 fastest runners in this evening’s session. Audi was the best represented with six cars contesting SuperPole, four of which finished among the top-10. With SuperPole complete, the stage is now fully set for the 70th edition Total 24 Hours of Spa. 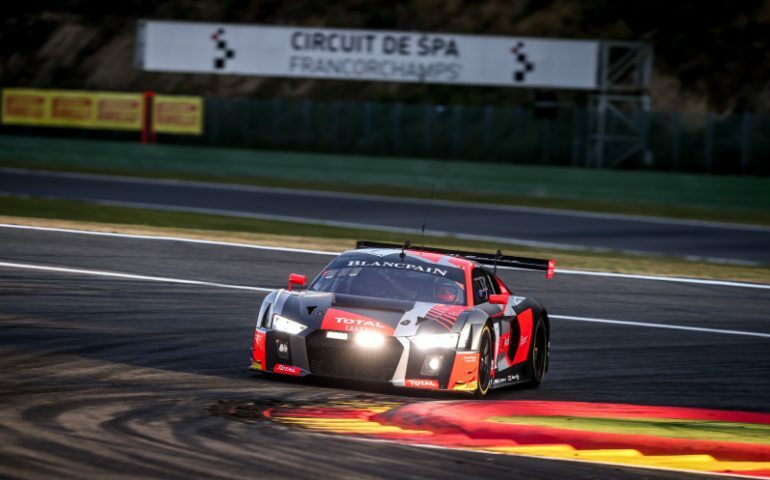 The biggest GT race on the planet will begin on Saturday at 16.30 local time, with the #1 Audi Sport Team WRT machine leading the field into a twice-around-the-clock battle at the iconic Spa circuit.